Each with 8 Rifle Machine Gun teams, a Mortar and a Bazooka. 1 Platoon of 4 Chemical Mortars. With P-40 Warhawks in Limited Air Support. Mission: Cauldron. 2 objectives are placed. Both defenders and attackers start in prepared positions. Attacker wins by taking either objective. Defender wins if no attackers are on the defenders side of the board after turn 6. Attacker has random deployment. Defender has delayed reserves, the attacker normal reserves. 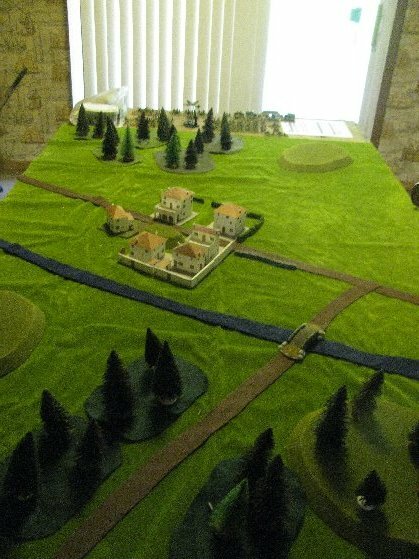 Numerous hills and fields populate the board. All hills are high enough to hide behind. A Road traverses the board from east to west. A stream cuts a quarter of the board from south to east. Faced with defending two spread out objectives, the Americans opt to deploy two of their large Parachute Rifle Platoons, keeping the remaining Rifle, Mortars and M10's in reserve. Each platoon was on the board was covering one of the objectives. The Soviets started with random deployment, but rolled a couple of 5's and 6's, and so got to pick the quarters they wanted to deploy in. So they deployed the Shermans and the Katyushas in the northwest quadrant, with the Tanks a short distance from the north objective. I discovered something about the Google program, Picassa today. If you delete the pictures from you hard drive, Picassa will synchronize, and delete them from your web album. In the blog, the pictures will be replaced by a "File Not Found" symbol. Once you publish, you are OK, but before then, you run the risk of losing your work. In my case, I lost 4, count'em 4 copies of the photos. I deleted them from the camera, the temp download folder, the shrink to size folder, while Picassa deleted the photos in the web album. I was saved only by the recycle bin. Soviet Lend Lease Tanks backed by Katyushas in the northeast corner. 1st Parachute Platoon in the southwest corner. 2nd Parachute Platoon in the northwest corner. The defender moves first in cauldron, and the Americans made the most of it. Aircraft came in blowing up two Shermans. While mortars barraged the Katyusha observer post and supporting AA gun. This had the effect of pinning the entire Katyusha battery. Soviet reserves arrive. They bring on the SU-122 battery. Being Fearless, the Katyusha's roll a 1 to unpin, and so remain cowering under their trucks. The tanks and SU's advance, throwing some 32 dice of MG fire at the dug in Americans to no effect. The SU's, however can shoot at the mortars, which shot, and so were not considered gone to ground. The SU's rolled two sixes to hit, but a one/five in the firepower rolls, and so killed only one team. A blurry "P-47" bombs the Lend Lease Shermans, destroying 2. Katyushas pinned by a single mortar, advantage, Americans! The Katyusha muff their unpin roll. The SU Battery arrives from reserves and advances to "Volley Fire" range. While the surviving Shermans pin the front of the 2nd Paras, and contest the objective. To avoid providing a better target, only the mortar from the 1st Parachute fired, causing a hit, but no damage. Again the planes came in, destroying an SU-122. The Soviets decide all their main guns are within 16" of the target, and just shoot. 6 shots from SU-122's with Volley Fire, 16 shots of 75's and 16 MG's from the Lend Lease Shermans. Pinning the Paratroopers, and killing a Rifle Team. Range is good, no need to move, open fire! No American reserves arrive. American aircraft arrive, again targeting the SU's, but the combination of only having one plane and an excellent armor save prevented any kills. Soviet reserves arrive, the T-34's follow the SU's on the north edge of the board. The Katyushas finally unpin, but fail to range in. But between the tanks and assault guns there was rolled 16 dice for main guns, 18 more for machine guns, 3 for the single .50 cal, while "Volley Firing" 6 Breakthrough guns. This combination killed a total of two teams, and pinned the 2nd Paratroopers. No American reserves arrive. No American aircraft arrive, its beginning to look very bad for the Yanks. Feeling the need for a decision before the American reserves can upset things. The Soviet tankers push forward to assault range. The 2nd Parachute is looking at a wall of steel. Phase 1, shoot, killing another team, pinning the platoon. Phase 2, assault the corner with the smaller T-34 Tank Company. Trading a tank, for a paratrooper team. There was a lot of back and forth here before the final resolution. The Soviets have taken the objective. All the American reserves arrive. The 2nd Parachute Platoon remained pinned, and so cannot approach and contest the objective. Mathematically, neither can the M-10's reach it either coming on the board edge. Even after successfully assaulting the Katyusha's Commissar, Spotter, and AA Teams. So the M-10's, assisted by the Rifle teams of the Chemical Mortar Platoon, and the 3rd Parachute Platoon amused themselves assaulting the Katyusha Battalion. The Battalion was reduced to just its Commissar, but passed both morale checks, giving the Soviets a 6-1 win. All the American reserves arrive, the M10's, the 3rd Parachute Platoon and the Chemical Mortar Platoon. The Americans cannot reach the objective. Which simplifies their decision tree. The 3rd Parachute Platoon and the M-10's rip through the Katyushas like flak though a goose. Killing 10 out of 11 teams.